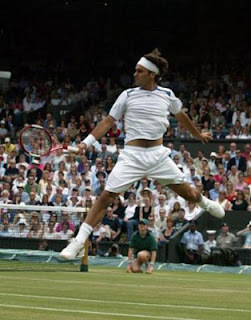 The 21st century World-Wide Issues: The best tennis players and their difficulties. The best tennis player for me is Roger Federer because os a tennis player with the best technique, is very fast, he is the number 1 in world ranking and have won 16 grand slams, he beat a record and is a legend because healso do charity to poor people and for me that is a good player. Other splayers are Rafael Nadal, Novak Djokovic, Andy Murray, Andy Roddick, Juan Martin Del Potro, etc. This tennis player are very nice and have won several titles and grand slams, but no body for me is better than Roger Federer. Some tennis player have a time of crisis like Rafa Nadal because he have a problem with his knees and because of that he couldn`t play Roland Garros AND wIMBLEDON and there he start lossing and lossing games and start been bad, then he start changing his service and his shots and that make him have problems with his arms and legs, but this could happen to any boby and is a problem that they can solve and go with your arrer. I like tennis and I play it so thats why I talk about this. Posted by Andres at 6:35 p.m.